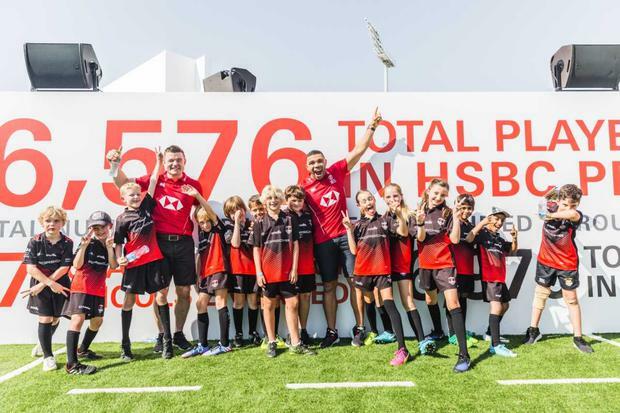 Brian O'Driscoll (left) and Bryan Habana (right) with kids at the HSBC Dubai Sevens. He is one of the greatest rugby players ever but retirement has allowed Brian O'Driscoll develop an appreciation for the abridged version of the sport. Rugby sevens is going from strength to strength, with the surge in interest that accompanied its addition to the Olympics in 2016 continuing on into last summer's exciting Rugby World Cup Sevens in San Francisco. Ireland legend O'Driscoll has had a front row seat to the explosion of the sport since hanging up his boots in 2014. As a HSBC global rugby sevens ambassador, O'Driscoll travels the world during the HSBC World Rugby Sevens Series, taking part in coaching clinics and events as well as enjoying the action. One of the many perks of the job is the exotic locations he gets to pitch up in, with O'Driscoll on location to take in the Dubai Sevens this weekend. Having studied the sport closely, he thinks that the fitness required to excel at sevens is a step up from the fifteen-man code, and thinks that the range of skills needed to play the sport is also a big plus. O'Driscoll thinks that young Irish players not yet ready for provincial rugby could benefit from playing in the sevens program, which happens in many other countries. "You see that in New Zealand," O'Driscoll said. "Sevens gives you an opportunity to get game time if you aren't coming through your provincial set-up at 19/20 years old. It gives you an opportunity to grow your baseline fitness, which is vastly different to what you need for fifteens. If you are fit at sevens, you will coast at fifteens. You can develop your core skills. Passing, in particular, is a huge one. You can't carry bad passers on a sevens team. I think it is a great way of building the early part of your professional career if you have aspirations to go on and play at the elite level." O'Driscoll knows better than most how tough it is to get around the pitch in sevens. As part of his HSBC role, the former outside centre trained with the England sevens side last year, taking part in a brutal session known as the 'death zone'. O'Driscoll compared it to the tough pre-season training sessions he endured when Michael Cheika first came to Leinster, but says that it gave him a massive insight into just how hard sevens players work, and how fit they are. "The big difference is that you can switch off in fifteens and probably survive," he says. "The ability to stay constantly connected and work until the whistle goes is the difference between sevens and fifteens. If you make a tackle and get back to your feet and rest for two seconds, you are going to be the reason why a try is scored on the next phase."